If you're considering getting a private investigator background check on someone you will want to know the ins and outs of what to expect. You will want to ensure you get an accurate background check and not just some information gleaned from a Facebook profile. Pay for a cheap background check and you will get what you've paid for; a few details that you probably already knew. So first of all, what is a background check? A background check or background screening, in simple terms, is to check the identity and credentials of someone. A background check's purpose is to prove or disprove the accuracy and truth of who someone is, what they are telling you, what they have done and what they get up to. It's very easy today, for someone to hide or mask their true identity and their true intentions. We live in an age where even neighbors are strangers, despite having lived next to each other for years. Depending on the situation or reason for checking someone out will determine the thoroughness, and how detailed the background check investigation should be. In some instances it may not be necessary for a private investigator background check, if for what you want one for is not that sensitive or serious. A simple online background check may suffice. However, if you have a fortune, want to protect your assets, business, public profile, children, etc. then a fully trained background check investigator will be necessary. 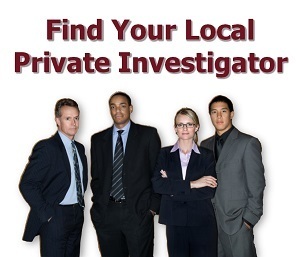 A background check private investigator should be aware of the laws governing this type of work. This ensures they conduct their background investigations legally and stay on the right side of the law. Not all private investigators offer background check services so you will have to ask at the beginning stages before hiring them. What Types Of Private Investigator Background Checks Are There? Investigator background checks are done for a variety of reasons and for a variety of entities and individuals. But before going into the different types of background checks and the reasons for them, it's good to know that there are two approaches when checking someone out. These approaches are Overt and Covert background checks. + Overt: an Overt (out in the open, not hidden) background check will be carried out with the FULL knowledge of the subject that the check is being done upon. The subject will have signed a consent form giving authority to ask for and obtain personal information about them. + Covert: a Covert (hidden, not revealed) background check will be done by a background check investigator without the knowledge of the subject. Again, depending on circumstances will determine the approach that is taken. But bear in mind, if the subject is aware of impending checks and if they have criminal intent then the chances are they will strike first, or with a bit of luck, promptly leave the scene. Is simply checking out who one is or is about to associate with on a personal level. Examples of this type of personal background checking is for pre-dating or dating - finding out more about the online date you've just met; or, a pre-nuptial background check where significant finances, property and assets are at stake. A personal private investigator background check on a potential spouse could save thousands later on. This type of check can be done with the partner's knowledge or not. This is a background check for employment and checking the details, past employment history and records of potential employees. Pre-employment background checks are an integral part of the hiring process in companies, particularly companies that have highly sensitive work and information. Employee private investigator background checks are usually done with the full consent of the applicant and before any contracts of employment are signed. Potential candidates for high powering positions go through the process of having their full work history, education and qualifications scrutinized in case they fraudulenty acquire a position and pay they are not qualified for. Likewise, in the lower ranks of the workforce, background screening and employment history background checks ensure a business gets what it has asked for. A private investigator background check on a company or business, checks to see if the business is what it is and not just a front held up with all-talk and words alone. This type of check - done on the business itself and not an individual - is beneficial when takeovers or buyouts or impending business purchases are contemplated. The company assets, records and materials are scrutinized for their veracity to ensure the buyer is not being led down the garden path by con-artists or fraudsters fluffing up a failing or bankrupt business. Apart from inspecting the actual company records it's also a good idea to focus on the owners or directors of the company. For this, the background check private investigator needs training, experience or qualifications in forensic accounting or business accounting. If you are in a position of having to employ a nanny or au-pair to help around the house and look after your children, then it will be most advisable to get a nanny background check done, particularly if leaving the children alone with them. There are companies that specialize in hiring out people as home helpers and as a matter of course do nanny background checks. It is also important to know that when you hire a private investigator - who will conduct the usual checks - that you can also ask them, as part of the private investigator background check, to install a hidden spy camera, or nanny cam as they are known. This nanny cam will record the nanny with your child, giving you first-hand knowledge of how they treat your child. Being a landlord you are simply putting your property in the hands of total strangers. Hiring a private investigator to do a background check on a potential tenant can give you a feeling of security. Nothing is worse than a tenant doing a disappearing act with rent owed, or gutting the property, selling the fixtures, or even using the property as a brothel. A renter background check should be done before any lease agreement is signed and most definitely before any keys are handed over. Similarly, with a private investigator background check done on a tenant, a tenant or renter may want to get a background check on a landlord. Having the landlord from hell would certainly cause problems and hiring a background check private investigator to do a little digging can be the difference between happiness and hell. How Much Does A Private Investigator Background Check Cost? + How reputable is the company - Search for a background screening company that has good online reviews, or find out which companies others use. + What does the check consist of - Find out how detailed the background check is and what questions / information are requested. + What online sources or databases do they use - Get an idea of the different sources of where the information will be searched. + Are the databases up to date and the information current - Find out the frequency of updates or to what extent the information is up to date. It's not much use having out-dated information. + Is it just an online background check - Some companies only do online database checks. You may want a more detailed physical boots-on-the-ground check done as well. + Are there physical checks or visits carried out - Find out what, if any, actual visits are performed for the background check. Is it just online, emails, and phone calls to various sources? + What levels / options of background checking are there - the background check company may offer different types of background screening services at different prices. + Level of importance - what is the purpose of the check and how important is it to get the maximum amount of the most up to date information possible? The last point comes down to you and what you are willing to spend for the best background check that you're willing to pay for. Cheap is not always poor quality and expensive is not always the best. An online company costs and private investigator's fees for a background check can be quite different. Finding the best background check company or background check investigator will come down to searching, checking and cross-checking businesses. Should You Do Your Own Background Checks? Doing your own background check is a risky game. It's not just a case of checking out someone's Facebook or Twitter account; there's more! You could do your own private checks but in some countries and states it is a legal requirement to possess a license, such as a consumer credit license or a PI License, to perform certain credit checks and activities. Also, a private investigator in Idaho will have different background checking laws to adhere to than a private investigator in Illinois. There are also data protection laws that need be followed when obtaining, collecting, storing, and passing on personal data. Besides some legality issues, doing your own background checks isn't advised and should be left to the professionals. Consider this; would you build your own house if you weren't a builder? Also, background check companies and private investigators, as a part of their business, invest a lot of money in subscribing to and using quality information databases. These database providers don't come cheap. As a quick note; online background checking companies may only use databases, phone calls and email, to check on someone, whereas a private investigator can be asked to do personal visits if required. The old adage "Actions Speak Louder than Words" should be observed here. A private investigator is trained in surveillance techniques that can be used for a real-time boots-on-the-ground check of an individual and what they get up to. I Want A Background Check. What Now? If you are a business, particularly high risk, then consider as part of your hiring process some kind of background screening. If you are an individual then consider it an option, particularly if a parent whose child is left with babysitters or nannies. If you are a property owner with tenants then, as a renting business, should get a private investigator background check done on your tenants. Leave no stone unturned when it comes to checking out someone's background! 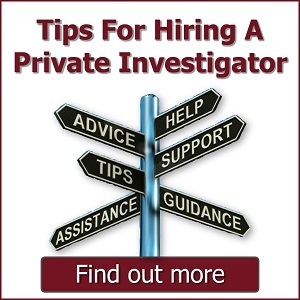 If you want to hire a private investigator for a background check, search our PI directory.